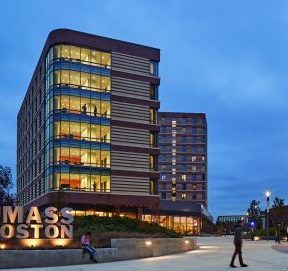 Capstone Development Partners recently announced that the University of Massachusetts Boston (UMB) Dining and Residence Hall project has achieved LEED Gold certification from the U.S. Green Building Council (USGBC). "We are thrilled," says Jeff Jones, principal, Capstone Development Partners. "Through the hard work and dedication of all involved, we were able to exceed our initial LEED Silver target while staying on schedule and on budget and hope it will continue to yield cost savings through the enhanced sustainable features. Most importantly, we hope this certification will be valued by our current and future student residents." Location of the project site on land that is considered a brownfield redevelopment. Water savings of 34% achieved by using low-flow showers, faucets, toilets, and urinals. An energy cost savings of 26.8% achieved through the implementation of a high-performance building envelope, energy recovery units, hot water efficiency, and 100% LEED lighting. Thoughtful selection of cool roofing and hardscape materials to reduce the heat island effect. A team of engineering firms did the engineering work required. Nitsch Engineering, with offices in eastern Massachusetts and Washington, DC, handled civil engineering. AHA Consulting Engineers, with offices in Lexington, MA and Arlington, VA, did the electrical engineering. And WSP, based in Montreal and with offices worldwide, handled mechanical, electrical, and plumbing (MEP) engineering. "As the first residence hall on our campus, this development created the opportunity for our students to have a traditional residential college experience," says Katherine Newman, interim chancellor, University of Massachusetts Boston. "We are especially pleased that it has achieved LEED Gold certification, as it aptly reflects our commitment to and our students' interest in sustainable development." Capstone Development Partners, LLC develops student housing in the on-campus and university-affiliated student housing market. The company is headquartered in Birmingham, Alabama. For more information please visit http://www.capdevpartners.com.